Ville Lasalle is a part of town that generally does not show up on my brunch radar. Of the places I have seen, they have been more of a traditional breakfast theme and there are so few compared to the amount of people living there. Lasalle also has the benefit of having a variety of ethnic groups giving me the hope to find some funky ethnic inspired spots, but as of now nothing has shown up. When meeting up with a friend of mine and fellow blogger Optimus Mastro I asked him to find something in Lasalle that is yummy and new to me. Marchigiani hit the table and away we went. Marhigiani is a blast from the past. It’s a community butcher shop-meet-grocery store but not like the large ones we go to. This is one of those old ones that were small and would meet the neighborhoods needs. While they still do exist, they tend to get swallowed up by the big chains. Marchigiani is like looking back in time; they have all these traditional Italian items you can buy like the kind of stuff my grandmother would have at the table. The butcher shop aspect is also cool since you see people getting their meat orders and then there is this little kitchen section on the side with a couple of tables and chairs all with a capacity of under 20 seats. The menu is a simple chalkboard with a couple items and specials that will change every week including a daily special as well. This day’s special was Tripe, fillet of sole and stuffed peppers. They also had sandwiches priced from $6-$7.50 as well as a special chicken cutlet for $8.50 along with some smaller sides like arancini and sausage rolls. You can probably tell right away that this isn’t the traditional bacon and eggs fare but rather, more like lunch. That being said, it was quite a unique place so I felt it needed to get a write up. 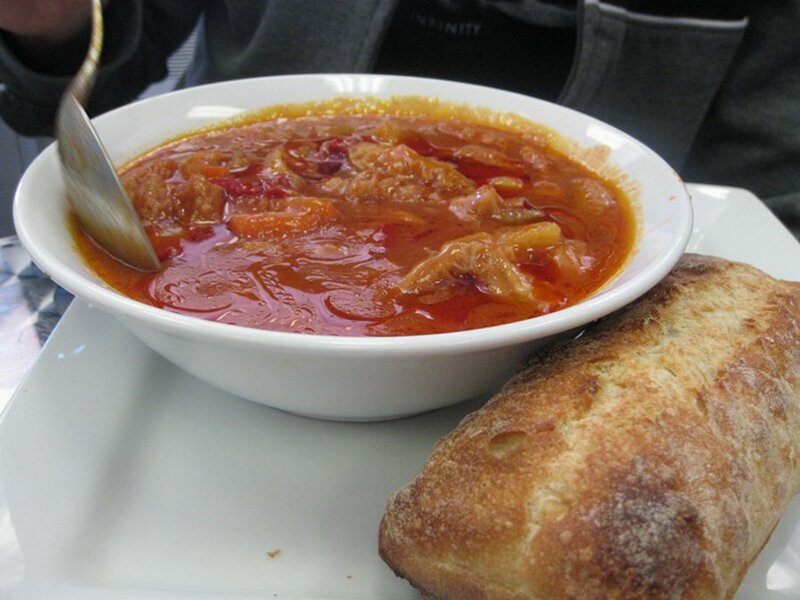 My friend had the Tripe ($7.50) which, if you are not familiar with, is a traditional Italian dish with red peppers, tomatoes and a nice soupy broth. It also came with ciabatta bread on the side for dipping. The bowl was quit large and the tripe was delicious. Tripe is actually a cow’s stomach, although it can come from other animals but it is most popular with cows. Most people are scared by this and won’t even touch it and I can really only think of 2 other people I know of that will eat this. I, on the other hand, love it! I also am able to eat anything so weird food does not scare me. What makes this interesting is that you will not find tripe on many menu and it might be only the second time I have seen this on a menu since I started reviewing. 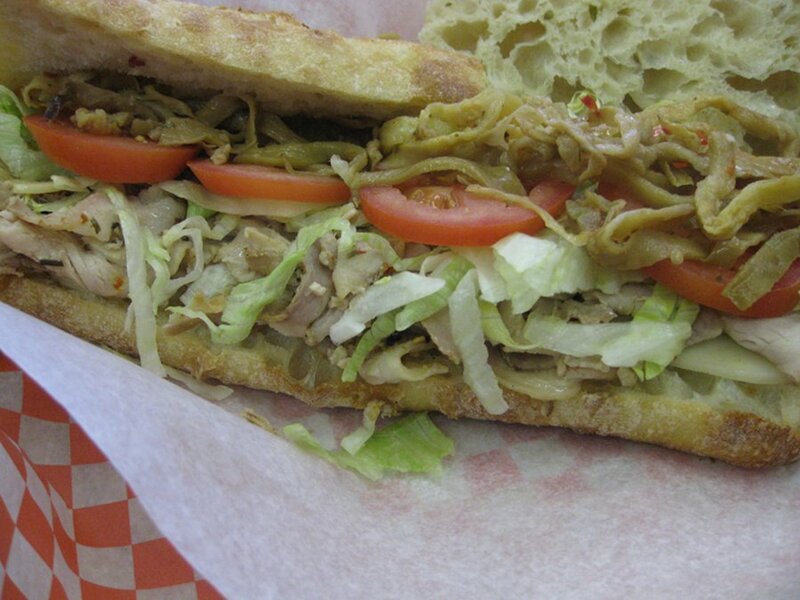 The porchetta sandwich ($7.50) came on a ciabatta bread with eggplants, porchetta meat, salad and tomatoes. The bread they used was great as it was soft enough that it did not leave tons of crumbs yet still firm enough to soak up all the oil and not get mushy. The meat was excellent and the simple dressings of pickled eggplants, tomatos and lettuce provided great taste. Service was limited since it was only one person who took the order and we paid. He seemed nice and even made some jokes and small talk with some of the people in the line waiting to get their food. Considering this is a butcher shop, your vegetarian options may as well be less than nil and if eating at butcher shop with meat all around bothers you then you may want to skip this one completely. Despite being more a lunch spot than a brunch spot, the food was great, tasty and well priced. You definitely got quality food for a good price. I cannot unfortunately rate this place in regards to brunch spots, since it is a lunch spot (I rated it on a whole) but I liked it and you are in the mood for an interesting Italian butcher/lunch experience, then why not? 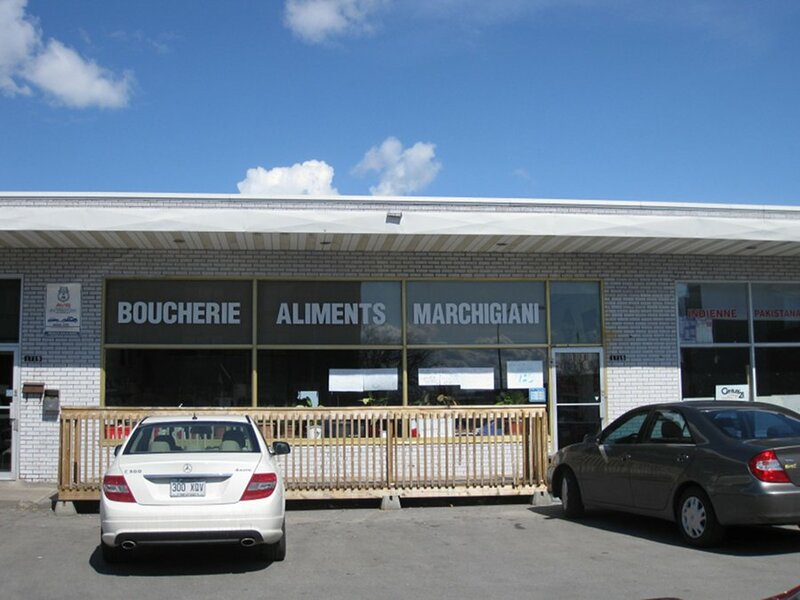 Marchigianni is easily the best, because the food just like Montreal Brunch Review is simply the best! Grear spot. Love this place. Everyone remembers their first time there. If you love tripe look for it at any self respecting pho shop.